After finishing the Lychguards and Immortals I came up with an idea of magnificence. Build Deathmarks from the left overs of the Immortal/Deathmark kit. 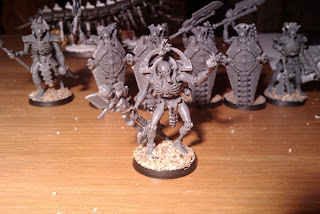 Another idea popped into my mind, a Cryptek. Or more a Cryptek with the Abyssal Staff and Veil Of Darkness, a Harbinger Of Despair! You know, the one with an AP 1 flamer and Deep Strike shenanigans. Not the best conversion I've done, but also not the worst. It will suffice until a better one will appear. Hmm, wonder if I'll ever paint it. It is hideous! Doesn't look so hideous on the pic. Looking forward to see it IRL.